We’re so glad you’re interested in George Walton Academy! The admissions team looks forward to working with you throughout the application process and hopes to make it as easy as possible. If you have questions or concerns about your application, please don’t hesitate to contact Director of Admissions Cari Bailey. 1. Applicants for all grades should complete our Online Application. 2. Print, sign and deliver the Release of Records Form to the student’s current school. 3. Print and deliver Teacher Evaluation Forms to current teachers. 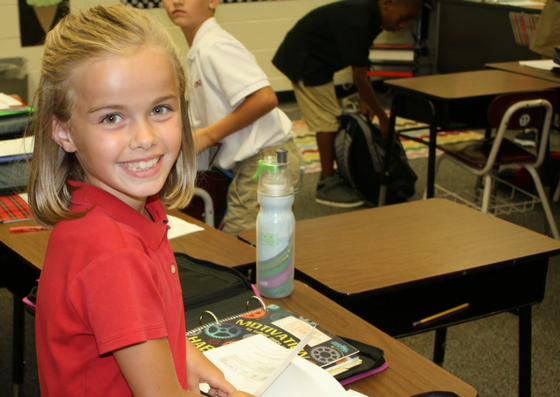 Students applying to K4 through first grade will submit one form, while students applying to second through 11th grade should submit two separate forms from current math and English teachers. 4. Provide GWA with copies of the student’s birth certificate and immunization records. 5. Schedule developmental screenings for students applying to grades K4 - 1. All necessary forms are easily downloadable from within the Online Application. September - January: Visit GWA and complete an online application. February 15: First round application deadline. March 31: First round enrollment contracts and fees are due. February - August: Applications submitted after February 15 will be evaluated on a rolling basis as spaces become available. George Walton Academy admits qualified students without regard to race, religion, national or ethnic origin.